With so many re-makes trying to mimic or pull away so much that it's no longer true to the original, "IT" comes out with a brand new re-imagining with all the right scares. Staying true to the iconic moments and including some lighthearted humor makes this telling of "IT" creepy and relatable. Being fortunate to have the film premiere 27 years after the made-for-tv series with Tim Curry as the menacing Pennywise the Dancing Clown and following a worldwide resurgence of menacing clowns, which were not promo gimmicks for the movie, "IT" comes to the big screen in a unique manner with its own distinct take on the menacing clown. 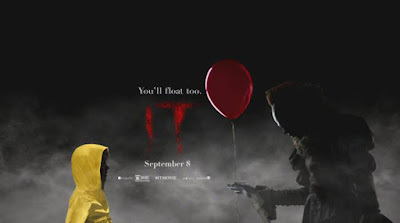 Producers David Katzenberg and Seth Grahame Smith said that the timing of release and the scary clowns are all coincidence and just worked out to the movie's benefit. As fans of Stephen King, they were thrilled with his reaction to the movie, it was almost like a stamp of approval for them and whatever happened from that point on, they could deal with knowing King enjoyed the movie. Director Andy Muschietti said that the King novel was one of his favorite and when he got on the project he began to work on his design of what Pennywise should look like. He has many hand drawn designs which he had in mind, but when Bill Skarsgard was cast he brought more to the part and the character evolved to what is in the movie. Pennywise actor Skarsgard said that he felt the pressure to be a great Pennywise, but with little description of the character he needed to trust Muschietti's vision and direction and the two were able to collaborate to make the character standout from how Curry's Pennywise did. A rated R horror movie with a cast of young actors can be tough to make, but with a story which treats every theme serious the cast was able to do justice to King's characters and story. Screenplay writer Gary Dauberman manages to keep a good pace to the movie and mix light humor, drama and suspense magnificently to keep the story flowing and continuously moving forward. Dauberman said that King's novel is masterfully written with everything in it already, writing the screenplay and making it mix well wasn't as difficult, but the young actors played off each other magnificently and with the direction from Muschietti the movie gained its great timing. Fans of the original made-for-tv series may see some familiar scenes, which are iconic even for the book, but they are great scenes to watch. The scares come frequently and so does the humor of the movie. The brilliant performances from the young cast cements the spectacular movie as more than just a remake. The ability to take on strong themes and be courageous in their performances as well as the kid nature that they bring is a must watch. The darkened theater, audience reactions and cold chill of the theater make for a great ambience to watch "IT." opens in theaters Sept. 8.